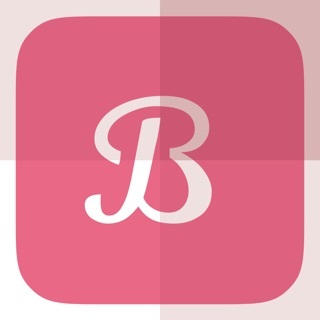 Bellashoot is a fun and user-friendly social beauty app that women need in their beauty vanity! You can share and discover thousands of beauty tips, tutorials, unbiased product reviews and much more by connecting with hundreds of thousands of beauty lovers, bloggers and experts around the world. This app was created to meet your daily beauty needs - so the next time you're getting dolled up, have a beauty question or want to share your latest beauty obsession you'll be reaching for Bellashoot. 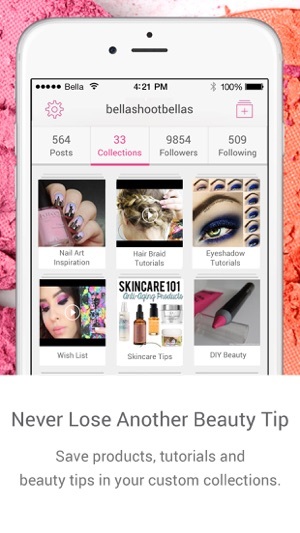 Bellashoot allows you to quickly share your beauty tips, tutorials and trends via pictures and YouTube videos. Snap a selfie, beauty product or tutorial, tag the products used and share in minutes. Stay on top of the latest blogger reviews, makeup tutorials, hairstyles, beautiful nails and more from Bellas around the world. Easily find and follow beauty bloggers, makeup artists (MUA), nail artists, hairstylists and beauty brands you can relate to and be inspired by. 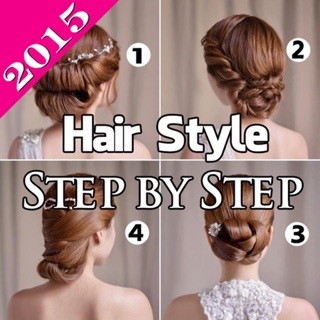 You can search by applying various filters like tutorials, inspirations, beauty tips, beauty news, blogger reviews, YouTube videos, nails, makeup tips, hairstyles, etc.) or search keywords. 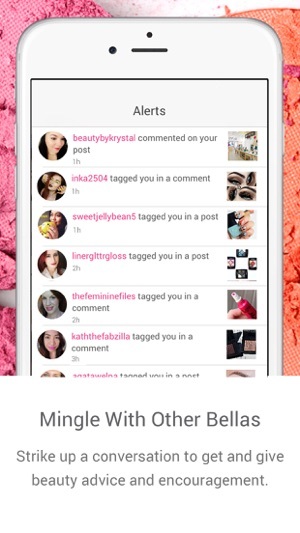 Get notified instantly when other Bellas like, comment or tag you in a beauty post. 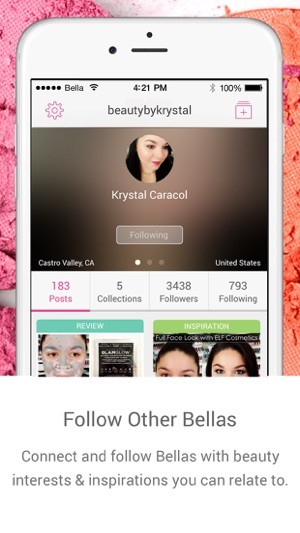 Bellashoot makes it easy to share your favorite makeup products, looks and tutorials with your friends on various social networks like Facebook, Twitter, Pinterest, Tumblr, Google+, etc. Customize your profile by adding your website and social links like Instagram, Facebook, Twitter, Pinterest, Tumblr, Google+, YouTube, Polyvore, Blogger, Wordpress, etc. Search and review your favorite beauty brands and products like MAC Cosmetics, Sephora, NARS, NYX, ULTA, Smashbox, Too Faced Cosmetics, Lime Crime, L’Oreal Paris, Urban Decay, Anastasia Beverly Hills, Benefit Cosmetics, Nails Inc, etc. DIY beauty tips, cosmetics tips, natural skincare tips, natural makeup, natural hair tips, DIY beauty recipes, eye makeup looks, nails, perfect manicure, eyebrow looks, summer eye makeup, lipstick products, winter skincare, makeup artists (MUA), celebrity makeup looks, celebrity hairstyles, Kylie Jenner makeup, Kim Kardashian contouring tips, Hollywood makeup, Hollywood beauty, braided hairstyles, Sephora, bridal hairstyles, medium hairstyles, long hairstyles, short hairstyles, acne remedies, organic beauty, Birchbox, IPSY and much more. We’d love to hear from you, please contact us with your questions, suggestions or problems to feedback@bellashoot.com. 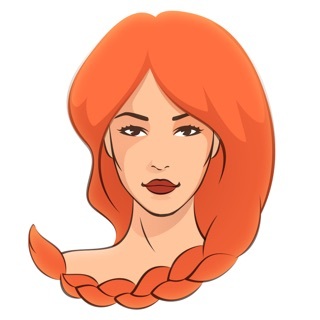 Bellashoot beauty app is perfect for your daily beauty needs. 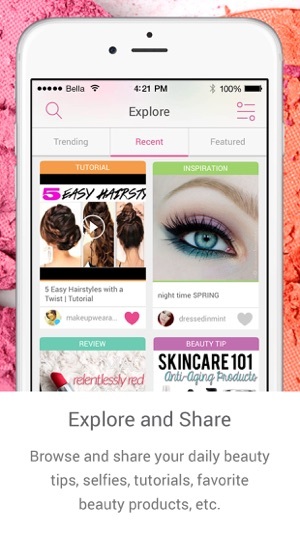 Download the app now & start exploring beauty in a whole new way! I think bellashoot is a awesome idea, a place we’re beauty lovers can gather and share ideas,inspiration,tips etc.. But they’re aren’t ever a lot of post from other people because of the low amount of publicity the app gets. To Bellashoot makers the app is fantastic but I suggest trying to get it promoted a little more! That way they’re isn’t just the same post in the featured recent and trending tabs everyday I go on. The thing that I love about Bellashoot is it aggregates everything that a beauty enthusiast or professional could possibly want under one roof to find inspiration, products, or just spend hours browsing for fun. It also creates a great vehicle for connecting with others in the industry that share your similar interests, which is hard to do on a network that isn’t really beauty focused. Bellashoot creates a true community and place for lovers of the industry to come hang out and connect with others.